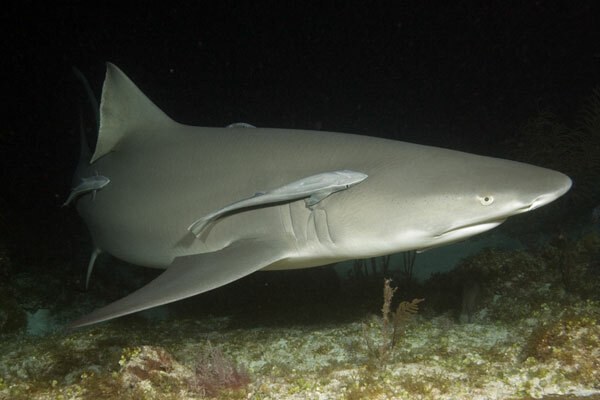 Photographing sharks at night presents a number of unique challenges which are compounded by the the apprehension that many divers feel when entering pitch black water with hungry sharks. 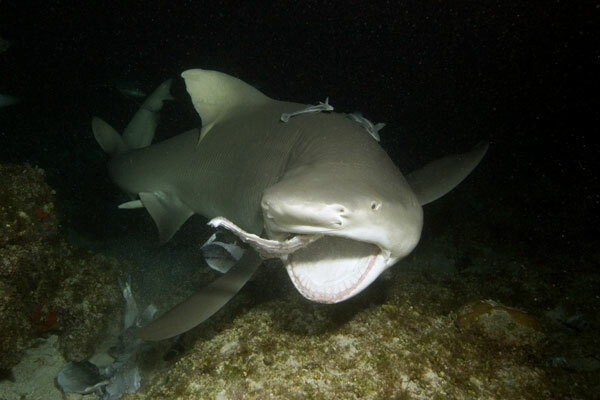 This is not an irrational fear because lots of shark species hunt after dark which may lead to them acting more aggressively around the bait, but the fact that it is dark does not automatically mean that they will become rabid eating machines. Unless there is enough stimulus to bring about a feeding frenzy the sharks will still exercise caution and do their best to avoid divers. Having said that a safety diver watching your back while you focus your entire attention through the lens is not a bad idea. The first challenge to the shark photographer is how to track the sharks movements with no ambient light source. This is done by using either an independent modeling light or one built into the cameras external strobe units. Not only does this help the photographer locate the sharks in the darkness but if trained in the same direction as the lens, it creates enough light for the camera to focus. Without sufficient light the lens will hunt continuously for a surface with enough illumination to register distance. When using strobes with built in modeling lights it is tempting to angle the strobes so that the light beams cross somewhere in front of the camera but if visibility is questionable it is wise to angle the strobes slightly away from the middle to avoid backscatter. The next hurdle is creating enough light behind the camera to allow the photographer to see what controls he/she is adjusting. This is best accomplished by a small mask strap light or helmet light. Another benefit of having this secondary light source is that it gives the diver the chance to glance around quickly (without dragging the camera) in order to check for sharks approaching from all directions. Correctly exposing the sharks white belly against the deeply contrasting background takes a bit of practice unless you're shooting TTL. Even then unless the shark is filling the frame the camera is liable to overcompensate for the surrounding darkness and overexpose the shark. If everything comes together as it did while diving with these Lemon Sharks, the resulting images will have a much more dramatic contrast than the same images taken during the day. Stay calm but have someone watch your back. Andy Murch is a Photojournalist specializing in sharks and rays.